The backlighting isn’t ideal, but not much I can do about that now. Funny story, so Kyle is always very startled when he wakes up and tends to jump and be disoriented for awhile. Fortunately we realized this just a couple minutes before he woke up so Taylor was able to grab Sam as Kyle woke up to save him from being thrown across the room. We had a very busy weekend. Here’s a quick rundown of our activities: On Friday night I held a bridal shower for my little sister Taylor and Eric went to a bachelor party for her fiancé Ryan. Afterward my whole family hung out at our clubhouse and we watched Stardust. Saturday morning we headed out to our nephew Elias’ baptism, followed by a family lunch. Immediately after the lunch we went to the Salt Lake Temple to be with Taylor as she received her endowment. Then we raced back to Provo to get Eric to a concert being held on BYU campus. We went straight from the concert out to dinner with my family (at 9:30pm!) and then finally home to go to bed. Sunday we woke up early to get ready for church as we were having Samuel’s baby blessing that day. After church and the blessing we had lots of friends and family over for an Easter lunch. My family stayed for most of the evening before starting their trip back to Cslifornia and we ended the weekend with Eric working his Sunday shift and realizing he had way too much schoolwork to do AND make it to work on Monday. Needless to say it was an exhausting weekend – although an awesome one! My family keeps a blog of highs and lows where Eric and I have both already posted our thoughts on the weekend as well as some more details and a fun video! Rather than reinvent the wheel we will just direct you there. Eric’s post can be found here, it’s pretty short so you can get through it quick. Mine is considerably longer (I had a lot of thoughts and feelings from the events this weekend that I wanted to share) but you can find it here. I wanted to post some pictures from Sunday’s activities, but I somehow ended up with only a few pictures and they’re all of my family (i.e. the Andersons – my parents and siblings) rather than our family (i.e. Eric, Samuel and I). I’m going to try and hunt down some pictures of the three of us and I’ll post them as soon as I get them. Well we’ve had our cute Samuel for over a month now and somehow I still haven’t gotten around to writing about how life is with our sweet baby. I’m sorry it’s taken so long. Taking care of this kid requires a lot more time than I had expected! But things are starting to settle in so I can finally write again. It’s been awhile so this will probably be a seriously long post (not that you’d expect any different from me :P ). I’ll try to at least add in lots of pictures so that it’s interesting. So I guess I’ll start where I left off from the birth story. We spent two days in the hospital after Samuel was born. My mom and Eric were able to switch off who was staying with me and who got to go back to our apartment and sleep in a real bed. It was a pretty uneventful stay. I didn’t even leave the hospital room for the whole time I was there. Strangely enough, I wasn’t at all stir crazy from being stuck in the same room the whole time. In fact, I didn’t even realize that I’d been in the same room for 36 hours straight until they were wheeling me out to the car. 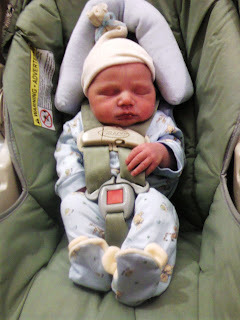 Samuel all dressed and in his carseat ready to go home! We went home from the hospital around 9pm the Thursday after he was born. We had to send my mom back to our apartment before we left to get his carseat and clean clothes for me. Since we had gone to the hospital so suddenly we hadn’t had a chance to put those things together beforehand. Luckily we only live 5 minutes from the hospital so it wasn’t a big deal to go back and forth. When we got home my mom had gotten our apartment totally cleaned up (thanks mom!!) and it looked great. We brought Samuel in and put him down in his bassinet to sleep. After putting him down we went into the front room and Eric immediately said, “We need a baby monitor.” I laughed because I’d been feeling the same way, like Samuel was suddenly really far away from us… even though our apartment isn’t all that big. He just was so little and helpless, it seemed strange to leave him all by himself. My mom had already been here for over two weeks so on Friday it was time for her to go home. My dad “had some business to do in Utah” so he flew up to drive back with her. Somehow I don’t think that business got done, but he did get a chance to come and hold his first grandbaby. One of the best things after Samuel was born was that Eric got two weeks of paid paternity leave from Omniture (thanks Omniture!!). In my opinion that should be required that the dad gets time off from work too. 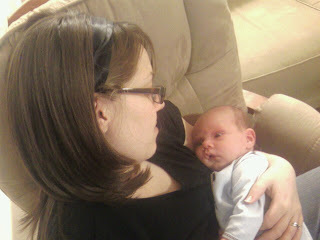 It was SO wonderful to have him home in the evenings while we were getting used to having a baby at home. Plus, it meant that he got a chance to really bond with Samuel during that time. Samuel is a total daddy’s boy – he will calm down instantly for Eric after screaming at me for hours. Sometimes it’s a frustrating that I can’t soothe my own baby, even doing all the same things. But I am SO grateful that he will calm down for Eric. Eric is such a great daddy and I love seeing him with our son. Once we got Eric better from his cold… I got sick. I had a fever and a bit of a cough off and on for a couple weeks. Luckily the fever never got high enough that I needed to go in to see a doctor, but it did make for a pretty miserable start to go from one of us being sick to the other. The cough wasn’t much fun because every time I would cough it would strain my stitches. I was SO grateful to have Eric around to be able to help out with Samuel so that I could get some more sleep and get better. The second week after we were home the Relief Society brought us dinners. That was more wonderful than I had ever imagined. My mom had made us some good meals and left us with some leftovers before she left, and Eric’s mom had brought us a meal when she came to visit so we’d had easy food to eat during that first week. But even still, I found that eating was one of the biggest challenges and I hardly ever found the time to stop and eat. It was amazing knowing that every day for that week I would have at least one good meal that I just had to put on a plate and eat. Plus, those meals provided enough leftovers to get us through the next week as well. As soon as we were just about out of leftovers… Amber brought us another meal! After that I was finally back to being able to make meals again and we’ve done pretty well since then. HUGE thank yous to everyone who brought us meals, you have no idea what a difference that made in helping us get readjusted to life. I’ve resolved that I’m going to find some meal that I can make really well and easily for other moms. I feel like I’m now more qualified to make those meals because I know better how valuable they are and what sorts of things are most appreciated. At the end of that second week we had Samuel’s two week check up! It was our first big excursion out of the apartment (although the doctor’s office is only 3 minutes away.. it wasn’t like it was that big of an excursion :P ). It was really exciting to bring Samuel in and feel like we could prove that we’d taken good care of him. His doctor confirmed that we had in fact taken good care of him (hooray!) and that he was growing well. In fact, he was growing really well! At his two week check up he was 9lbs 3oz and 22 1/2 inches long. That’s the 95 percentile for both height and weight! If you’re not familiar with that terminology, it means that on average out of 100 babies Samuel’s age 94 would be smaller than him and only 5 would be bigger than him. I’m still in shock that Eric and I made such a big baby out of two not very big people. At the end of that week my whole family also came up for my Great Grandma Bonnie’s funeral. She passed away at the age of 95 after living a very good life so it was a very happy celebration that she was finally able to pass on. My family was very excited to meet Samuel. I think Sam was a bit overwhelmed by having so much attention all of a sudden though! He slept through most of their stay but was passed around and held by every one. It was fun to get to see my brothers and sister finally get to see and hold their highly anticipated first nephew. We weren’t quite ready to take Samuel all the way up to Logan for the funeral that weekend and Eric had to start work again on Sunday so we stayed in Orem. However, we were finally feeling well enough to make it to church (this was the third Sunday since he’d been home, in case youve lost track :) ). So we got all ready and got to church… only to find out that our ward was meeting an hour earlier that day and was only holding sacrament meeting to accommodate the temple dedication that was being broadcast there that afternoon. Meaning we had totally missed our services for the day. Since we’d been sick and hadn’t made it to church for the couple of weeks previous we hadn’t known. We were a little bummed that we weren’t able to show off our cute baby to the ward but luckily we were able to attend another ward and take the sacrament. The following Thursday Eric and his co-workers got pizza at work… and woke up violently ill the next day. We spent the entire weekend trying to keep anything in Eric’s stomach. I’ve never seen anyone get food poisoning so bad! It was not fun for him at all. Luckily he was pretty much better by early afternoon on Sunday so he didn’t have to take any time off of work. Not exactly a great consolation for a sucky weekend but it was nice to not have to waste vacation days on food poisoning. Which finally catches us up to this past weekend. My Uncle Jay passed away last week (they say it comes in threes right?) so my family came up again for his “celebration of life” (he didn’t want to have a funeral so some of his friends held an open house style party in his honor instead). This means that my family has been up here every other week since Samuel has been born… and they’re coming again this weekend for his baby blessing. (For anyone that isn’t LDS, when babies are born they are given a blessing usually from their father if he holds the priesthood. In this ordinance they are also given their name and they are recorded on the records of our church. It isn’t the same as being baptized, they aren’t officially a member until they are baptized which they can choose to do when they are 8 years old or older) It’s been fun to get to see my family so much. Samuel will never be able to say that no one loved him! Jay’s Celebration of Life was on Friday night. After going to that we went to Eric’s mission reunion. We’ve been to these every six months since we got engaged and it’s really fun now because I now know the people that we’re going to see there and I look forward to it. It was SO fun to watch Eric showing off Samuel. You have never seen such a proud daddy as Eric is. He had to go find anyone who he had even remotely known and show them his son and how cool he is. So, that pretty much sums up the high points for us over the past month. Eric is down to his last four days of classes to wrap up his degree which we are VERY excited about! It will be so wonderful to have him just working full time, rather than working full time AND going to school full time. He would like to have more time to spend at home with us and working on his own projects and we’ll be excited to have him here! I can’t even explain how excited I am that he’s so close to being done. In fact, I think right now I’m more excited than he is because I can see the light at the end of the tunnel… and he’s facing a brick wall of finals. I guess that’s about it. Sorry this post wasn’t as picture filled as I had promised, the pictures I have don’t go with the things I was writing about. I’ll post some pictures of Sam in another post soon! As we have been learning how to deal with baby Sam’s gas and discomfort from time to time, we have learned a few tricks along the way. One of my favorite tactics to employ is the rocket-ship launch, where basically I help Samuel “jump” way high into the air. Don’t ask me how or why this came about, but it works! Well, recently, we discovered that music can also help to fascinate and calm the little tike. This picture depicts the expression usually on his face as he listens to the music. We know this is connected to the music because when we hold him to where he can move his head and look around, he would always face the direction of the speakers and source of the music. I think it’s a sign! Okay, maybe not, but just what I thought would be an interesting tidbit to share with you all.